I wanted to give an update about the "mystery" restaurant I wrote about a couple of weeks back. 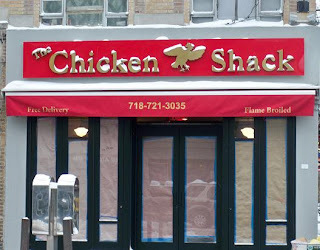 As noted by Astoria Realtor and loyal Foodista follower, Peter Horowitz, the restaurant is called the Chicken Shack. I've been monitoring its progress and the awning sign is fully up, displaying its name. I also called them today because I'm curious as to when they're opening. The man on the phone said, "in 10 days or so." Look out for it soon - menu to follow. Is this where Table 30 used to be? Chicken?! WHY DID I EVER LEAVE?!?! I know right? I can't wait to try it - looks pretty enticing. Awful...tried it tonight. Don't let anything tempt you in. It is worse than airplane food; the chicken tenders are so crisp and sweet they are reminiscent of cookies; the sandwiches are soggy and huge; the charbroiled chicken tastes worse than the pre-roasted chickens from key foods; and the bbq and hot sauces taste like sugar water mixed with ketchup to varying consistencies. And its ridiculously expensive...ugh, bad news. The Chicken Shack is definitely worth a try. We ordered take out on a Friday night for a group of six and nobody was disappointed with the food. Though there were some basic problems like freezing cold tomato sauce served with hot mozzarella sticks and some room for improvement on their blue cheese dip there were some higher points like the Buffalo wings themselves (crispy non-saucy variety). While I don't agree with the previous review that the place is awful I have to agree that the chicken souvlaki sandwich I received was a little soggy. I feel like can forgive this because it is simply as a consequence of ordering delivery. On the flip side the french fries pretty were really good and arrived hot and crispy. I feel the name is not trying to disguise it as something classy or more than what it actually is. It's a chicken shack and it was decent comfort food. I say give it a shot. I have to disagree with the previous post as well. We ordered a half chicken meal with mixed veggies, and both were very good. We didn't get what the side of sauce was all about cause it tasted like a super-crushed tomato, but the chicken was tasty on its own so we didn't need the sauce anyway. Haven't tried any other items on the menu, but want to try their ribs. I was also suprised that they have wine and beer on the menu. That's pretty cool! Thanks for those updates - I also think that it's worth a try. I'll keep your observations in mind and will concentrate on what they do best - chicken. Awesome - good to know about the ribs! We order Chicken Shack every once in a while for lunch at the office. I have to agree about the sauces- but overall I find it a great place to enjoy an inexpensive meal. Some of my favorites include the Chicken Souvlaki platter with brown rice & salad or I ask for Chicken Souvlaki over salad only & its a yummy filling Salad. We always ask for Whole wheat Pitas and 1/4 ribs. Niiice Anon - sounds yummy!